Fifty years ago, the forces that spurred improvements in economic well-being in the region included investments in the education system, shifting the development paradigm from agriculture to industry, and acknowledgement that the destiny of the region was tied to a global economy. In many ways, these forces have morphed and continued to modernize, but they are still crucial. However, state and local efforts are not forward-looking enough to anticipate and adapt in ways to take advantage of new opportunities. For the last third of the 20th century, the South played catch-up in education. The school segregation of the previous era was a purposeful public policy to provide an inadequate education to a large segment of the region’s young people. Through the 1960s, and in subsequent decades, the South got pulled along in the national momentum to forge a more educated nation. Before the 1970s, Southerners still thought in terms of a high school diploma as the end of education for most and the prevailing economic development formula demanded nothing more. But then, governors and legislators were confronted with the parallel needs of responding to desegregation orders and to industries and technological enterprises with jobs that demanded thinking and technical skills beyond a conventional 12th-grade diploma. As their leaders came to understand that diversifying their states’ economies would require a workforce of better educated people, Southern states invested to expand vocational-technical institutions or develop systems of community colleges. In some states, such as North Carolina and Texas, bolstering universities emerged as central to the modernization strategy. Some governors stepped up to national leadership in school reform, expanding kindergartens and raising standards in public schools. • 1971: U.S. Supreme Court’s Swann decision ruling that Charlotte, N.C., should use busing as a desegregation tool. Charlotte’s business leaders enthusiastically backed the decision. • 1974: Equal Education Opportunity Act passed by Congress to make bilingual education more widely available in schools. Today, Southern states face major issues in determining the future of schooling, particularly from pre-Kindergarten through high school. Improvements in K–12 education, at the beginning of the education pipeline, resulted from federal judges who issued desegregation orders, federal financing for schools with high enrollment of students from low-income families, a business community persistently concerned about a skills-gap, the expansion of jobs attracting residents from elsewhere, and “New South” governors and state legislators who adopted school reform and accountability measures. Today, Southern states face major issues in determining the future of schooling, particularly from pre-Kindergarten through high school. Most states now have a mixed system of traditional public schools, government-funded charter schools, secular and religious private schools, and home schooling. Still, the public schools continue to educate eight out of 10 Southern young people. As states have expanded school choices, a decade of budgetary austerity has left most states with a lower relative level of public investment in public schools and higher education than before the Great Recession. An analysis of National Assessment of Education Progress (NAEP) scores provides an example of the erosion of progress. 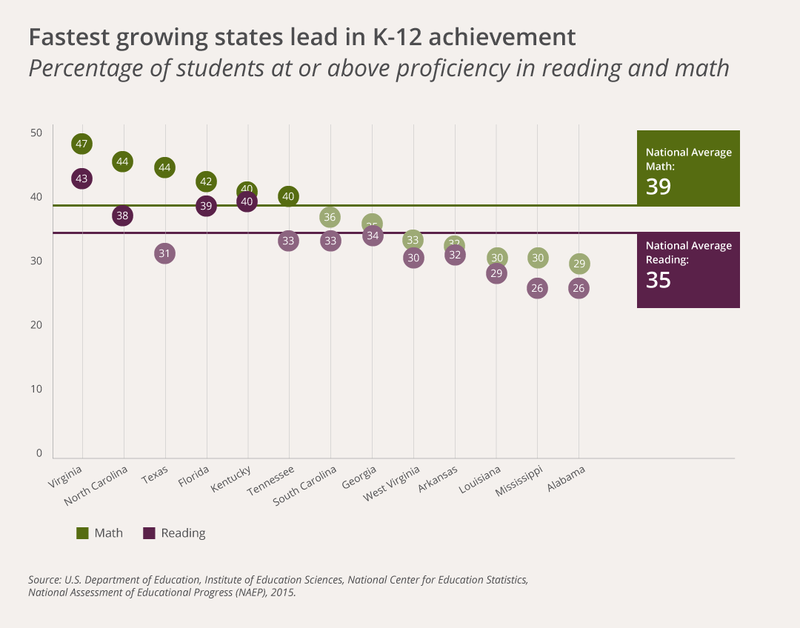 While fourth-grade scores in math and reading in several Southern states on the 2015 (NAEP) exceeded the national average—North Carolina, Florida, Texas, Virginia and Kentucky—several of the inner-South states consistently scored below the national average. White students generally perform better than Black and Latino students on all NAEP tests across grades and states with few exceptions. 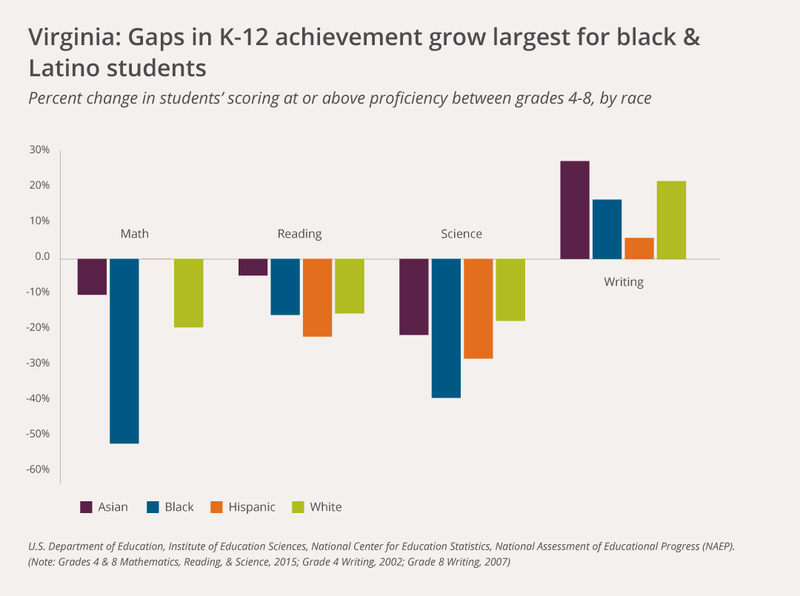 While NAEP scores of students of all races typically improve from grades 4 to 8 (with the exception of writing), black and Latino students saw smaller gains. Even in states with the highest postsecondary attainment rates (e.g., Virginia) and those with the lowest (e.g., Arkansas), blacks and Latinos aren’t catching up to their white counterparts. At the other end of the education pipeline, in the Southern states, adults who have completed high school range between 88 percent and 82 percent, and the number of Southern adults with a bachelor’s degree rose from a mere 5 percent during World War II to more than 33 percent today. The region’s turn-around resulted from an array of forces: the post-war GI Bill, the National Defense Loan program, and later Pell Grants fostered a dramatic increase in college-going. Federal research grants strengthened universities in the South as elsewhere—though African Americans were often excluded from these programs. 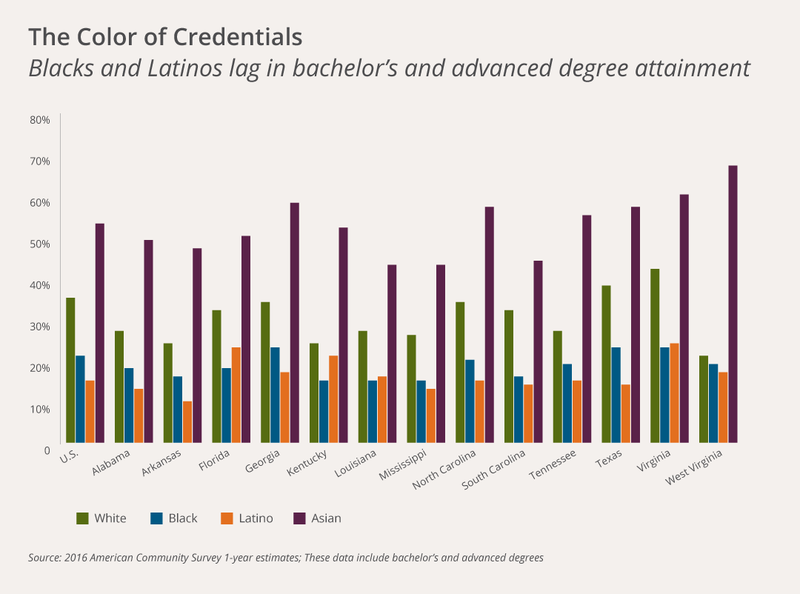 While a larger percentage of whites and African Americans now receive postsecondary credentials, the disparities among whites and African Americans has grown in most Southern states. The number of white Southerners who earn bachelor’s degrees has more than tripled since 1970 in every state except Mississippi and West Virginia (which have more than doubled). 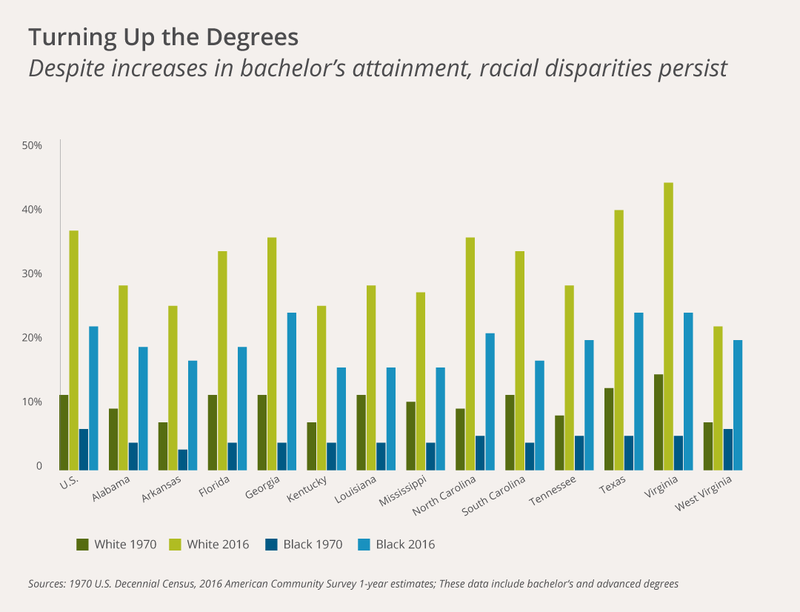 The percentage increase for African Americans is similar—but the percentage of African Americans with a BA is still significantly lower than white attainment levels because of a much lower starting point. The disparities are larger when disaggregated by gender. According to the Postsecondary National Policy Institute, college enrollment among African-American males grew at less than half the rate of their female counterparts between 1990 and 2008. Among Latino males, the rate was about two-thirds that of their female counterparts. Disruption of the Old South did not come only from the Civil Rights Movement, laws, and court rulings. For much of the 20th century, the South sought investment from afar by selling itself as a region of low-wages, low-taxes, cheap land, and plentiful non-union labor. Its economy rested heavily on natural resources: oil drilled from beneath soil and water, coal dug out of mountains, timber cut from vast forests, cotton and tobacco pulled off low plants. Once the taint of Jim Crow laws was reduced, the South found itself increasingly aligned with national economic trends and changes. In came fresh assets in manufacturing, banking, research and development, and budding high-tech enterprises. While extraction and farming remained major economic drivers, Southern states developed and diversified through the early 1970s to emerge as part of the rising Sunbelt, in contrast to the declining Rustbelt. Governors became super-salespersons for their states, often traveling abroad in search of new businesses. As with education, public support played a key role with investments from both state and federal government. Consider, for instance, the space race, with mission control in Houston, a rocket-test facility in Hancock County, Miss., the rocket-design center in Huntsville, Ala., and the lift-off facility at Cape Canaveral, Fla.
Once the South got past the petroleum squeeze and “stag-flation” of the mid-1970s, the region entered what an earlier State of the South report called its “gilded age.” In the 1980s and ’90s, the South outpaced the nation in population growth and jobs. Between 1987 and 2007, the South added more than 20 million jobs. 1970-75: The Southern Growth Policies Board (SGPB) reports that the region’s population grew by 8.8 percent between 1970 and 1975, compared to U.S. growth of 4.8 percent. “Net in-migration to the South exceeded 2.5 million during the 1970-75 period, while the Northeast and Midwest experienced net out-migration,” then-Florida Gov. Reubin Askew wrote in an SGPB essay. 1996: Bill Clinton signs Temporary Aid for Needy Families into law, replacing Aid for Families with Dependent (AFDC) and emphasizing work and personal responsibility. 2007: Housing and banking crisis results in major economic downturn, characterized as the Great Recession, lasting until mid-2009. 2016: Birmingham, Ala., raises the city’s minimum wage to $10.10 an hour in February; the state repeals the action two days later. The employment opportunities that have the potential to lift people out of poverty also have shifted over time. 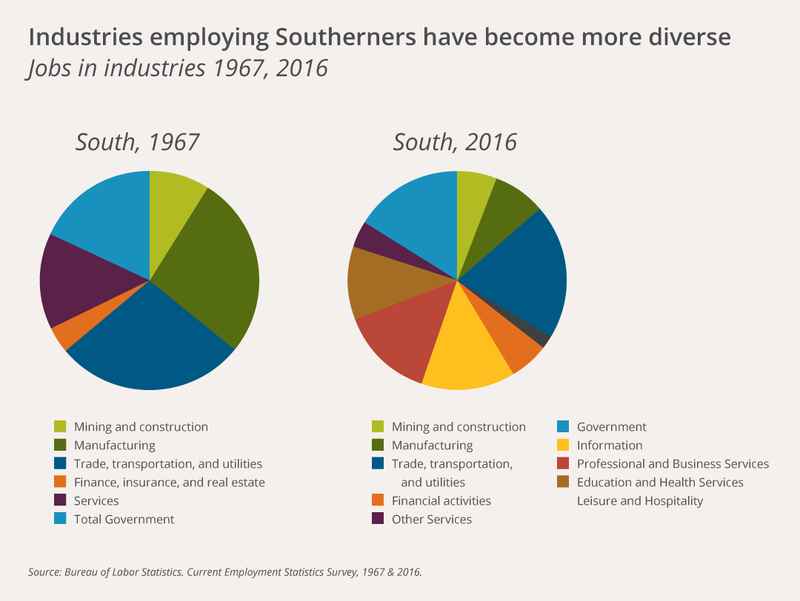 As is the case in the rest of the U.S., Southerners are working in a larger variety of industries. It’s difficult to track shifts in smaller or emerging industries (e.g., information or leisure and hospitality) or those who have been reclassified or combined over time, but the significant decline in manufacturing employment in the South over the last 50 years is undeniable. This increased variety in industries has not translated into better jobs for all Southerners. We define a “good job” as one that pays a family-sustaining wage, provides benefits, and offers the opportunity for career advancement. In all states, the median household income was higher for whites than it was for African Americans in both 1970 and 2015. 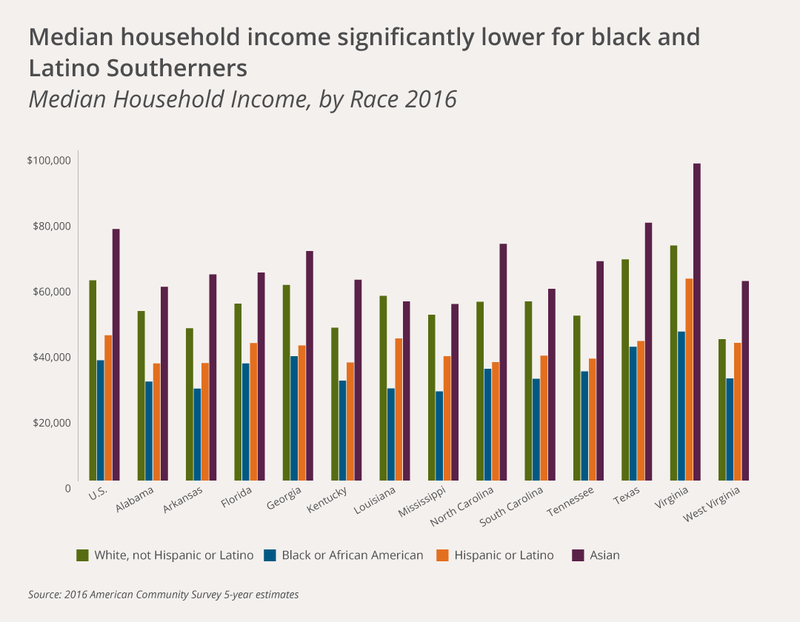 More disappointing is that, in all but Texas, the 1970 median income for white households exceeded even the 2015 income for African-American households. While the percent increase in median household income was much larger for African Americans than whites, they would have needed a far larger increase to catch up to white families by 2015. For example, the percent increase in the median household income increased by 46 percent for black Alabaman households, but by just 13 percent for white households. Given these numbers, it may appear that white households are not doing as well or that they are falling behind. 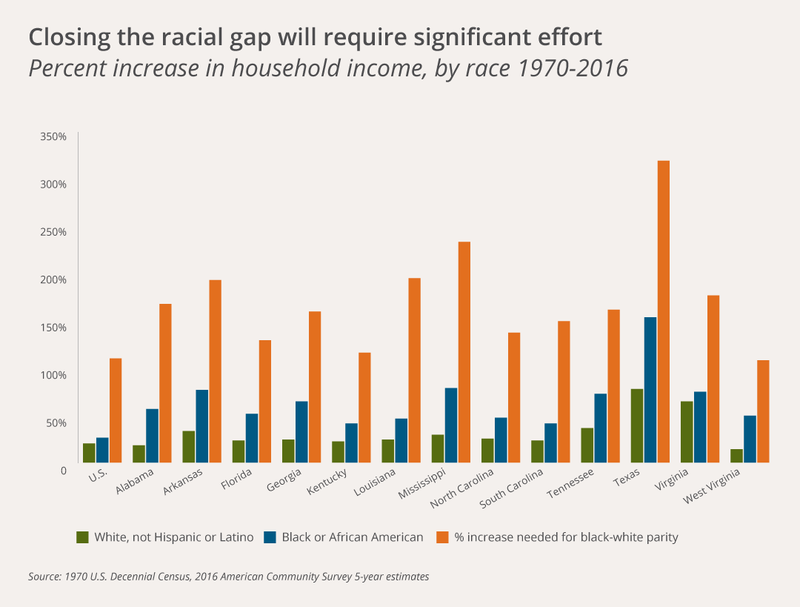 However, this disparity in favor of black households isn’t enough to close the racial gap in income; African-American households would have needed a 154 percent increase in their 1970 income to catch up to white families in 2015. 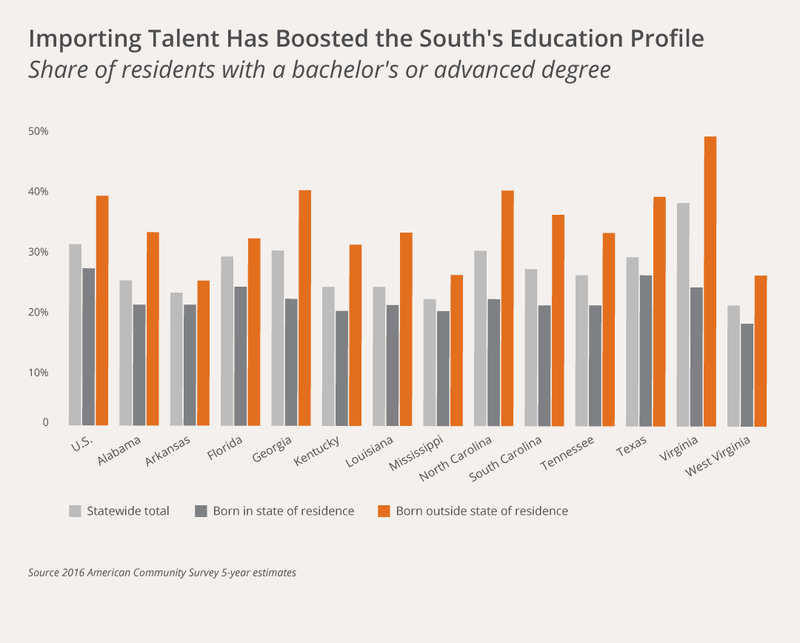 Local talent development systems that are equitable and intentionally designed are vital to ensuring sustainable prosperity and security in the South. According to Jamie Merisotis, president of Lumina Foundation and an expert in education policy and philanthropy, “The outcome that we need is new knowledge, [and] the transmission of knowledge ultimately results in talent. Talent that we can apply in the work force. Talent that we can apply in our personal lives. And frankly, we have a shortage of talent. The problem that we have in American society today is that we don’t have enough talent to meet our economic and social goals.” Merisotis also notes that, though there is still a wage premium in the labor market for higher degrees, “we don’t actually know what they mean” and “the labor market is signaling increasing dissatisfaction with what it’s getting.”13 A functioning talent development system progresses from foundational education to a postsecondary, industry-recognized credential or degree, and, finally, to a job that pays a family-sustaining wage and has potential for career advancement. Talent development systems can advance or weaken inclusive economies and societies, depending on institutions’ accessibility, affordability, and intentional connection with living-wage employers and local emerging industries. Local public schools, community colleges, and universities can be a cornerstone of educational opportunity in a community, but the pattern of increasing divestment in public institutions could affect long-term upward economic mobility prospects in the region. Constrained by limited resources, institutions are hard-pressed to find the time and the personnel to effectively connect with other educational partners and local employers to create a strong talent development system, stretching from K-12 all the way to living-wage work. 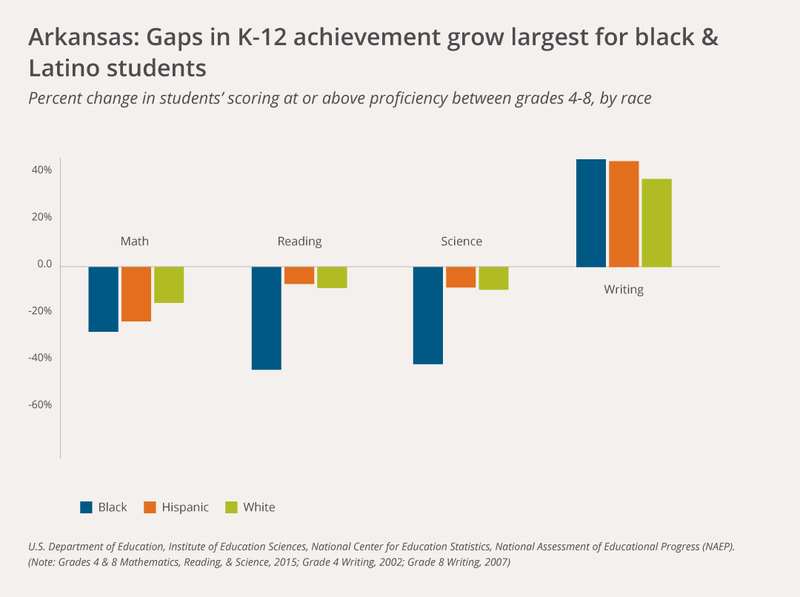 Racial gaps in K-12 test scores grow into even larger gaps in postsecondary attainment due, in part, to fewer resources in non-white, low-income communities. 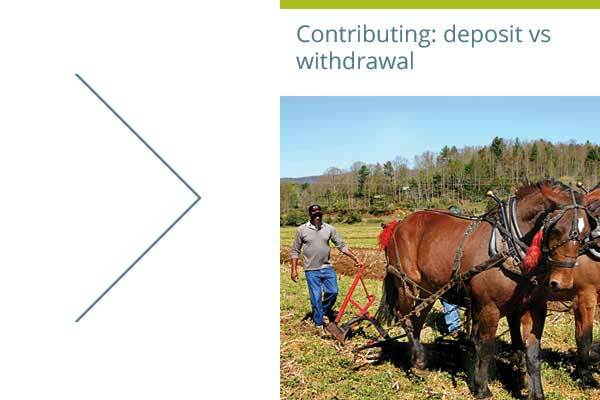 Changes in our economy have favored metropolitan areas and residents with postsecondary credentials, while rural areas and adults with lower levels of education feel increasingly left behind by workforce changes. The inequities that threaten a thriving talent development system are readily apparent in the racial, income, and geographic disparities along each point on the pathway. The very people who have been historically devalued in our education and employment systems will soon make up a significant portion of our workforce. Shifting demographics demand that we ensure a strong, coherent alignment between economic and civic institutions and equity all along the pathway from education to career. 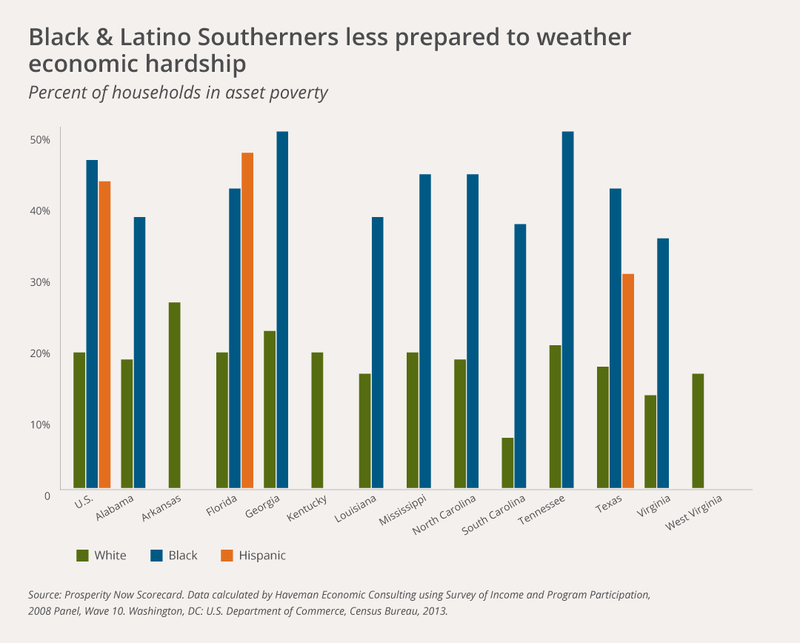 If disadvantage weren’t so concentrated among low-income, non-white, rural communities, families would be able to shoulder the burden of economic shocks and better prepare for opportunities to thrive, and our communities would be ready to welcome new and emerging businesses looking to invest in the region. Instead, local governments are forced to cobble together a complex, difficult-to-navigate, imperfect social safety net. If opportunities to build financial security were more readily available to all, tax dollars could be spent on developing a better postsecondary infrastructure and workforce development strategy. Though it is difficult to predict which jobs will be needed and available in any given community, if the population is undereducated, overly incarcerated, and without sufficient means to develop home-grown talent, municipalities are left with few prospects for long-term prosperity for anyone, let alone everyone. Without better alignment of education, training, and labor market needs, our talent development systems will continue to miss the mark, wasting precious time and resources of both institutions and students, employees, and employers. There is no competitiveness in a global economy without equity in the preconditions required for people and communities to thrive; a strong infrastructure of opportunity that links education and training with quality jobs and the related supportive networks that buttress development of professional skills and connections is key. Building that infrastructure in Southern communities will require a different kind of investment and engagement than what we have in the region today. 10 Western Interstate Commission for Higher Education (2010). Non-traditional No More: Policy Solutions for Adult Learners.